Organizations will be trying to find the mines forever. I was born in Srok Svay Tieb. I am 50 years old. On October 10th in 1979, 30 years ago, I was walking down the road to get some fish and some rice for the family to eat. I didn’t know there were mines where I was walking and suddenly one blew up under my legs. The one I stepped on was on a battlefield between Pol Pot and Lon Nol. They put mines down all over, and now they are still throughout the countryside, and organizations will be trying to find them forever. After my injury, it was really hard for my family and me. I am the oldest of seven kids, and I was always the one to take the responsibility. Nobody took over for me. For three years I just stayed at home. I couldn’t do anything. In 1983, I got my new leg. It was like being born again. When I got used to walking again, I started to take care of my siblings and buy food again. I would put it on the bicycle because we didn’t have a car. To ride the bicycle, I took this leg and I would press down on one side so that it would rise back up and I could press down again. I was really happy that I learned to ride the bike, and I wasn’t scared either. I didn’t think about anything. I was too happy. I would even just start to dance and wouldn’t think about anything else. I was only happy, and the people around me would follow me around, because it made them happy, seeing me so happy. I even learned Khmer traditional dance. I learned because I just wanted to dance. I thought I would never walk again, so when I got the new leg, I was happy to have freedom again. I used to perform and my siblings would watch. There was nothing like it. When it’s that hard for someone, they were happy to see it. I would go dance for the rich people who had parties, and they would record me dancing. Afterwards they let me watch. When I watched I always laughed at myself; I made fun of myself. I felt happy, but I needed to relax after, when it hurt. Now that I’m getting older and lazier and it’s more difficult, I don’t really do it. I’m 50 years old now, so I don’t want to dance now. Now, I stay at home. I don’t have any children. It’s just the two of us, my husband and me. My husband works as a barber. He drinks a lot and we have arguments about that. When I think of Cambodia’s past, I feel sad. When we were rid of Pol Pot, we didn’t have anywhere to go study and there wasn’t enough food and we didn’t have anything. I wanted to go to school, but I couldn’t. I wanted to work, but I couldn’t. I didn’t go to school and that’s why I wasn’t able to get good work. We endured a lot. It was difficult to endure. With family it is happy. My father died. My child died. My husband died. So sad. My son died in ’95 and my husband died in ’96. I remarried in 2002 and I still don’t have any children. There was just the one son that died. My son was 3 years and 8 months old when he died. If my son were here it wouldn’t be hard. I always remember that. I didn’t have children with my second husband. My son would be seventeen now. Seventeen. My father died and my mother is senile and old. There are still seven of us siblings, but we have all split apart into our separate families. It is just my husband and me now. We try to move forward together. I don’t know where this came from. I just started to cry in sadness. My second husband is a second cousin. My parents arranged our marriage according to custom. It was difficult for me when they did that. They found a husband who was studying to be a barber. Now, he’s always drinking. I’m never daring enough to say anything, so I just get depressed. Now if there is any land that needs to be planted I am always asking around to see if my husband can help. I let him do that and I stay at home and cook. He plants rice. He plants rice and cuts hair. He does really love me. We had an argument and I told him to leave, but he wouldn’t leave me. It’s just difficult. When he drinks it uses up money and it changes him. It’s hard. Everybody is going through the same difficulties. Mom Soeun is 50 years old, and lives in Prey Veng Province, Cambodia. 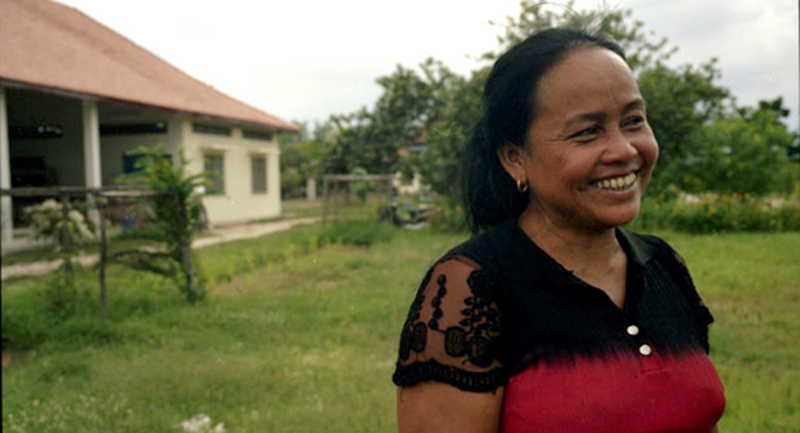 She survived a landmine blast in 1979, and receives rehabilitative support from the Veterans International Rehabilitation Center in Prey Veng.